When we last caught up with Bob Dylan, out on Highway 61, it was nine albums and a decade earlier. Whereas there were a few Dylan records considered for the afyccim 60’s list, “Blood On The Tracks” was the only contender for the 70’s and is seen by many as his best work from that era. It topped the US album charts and peaked at No.4 in the UK. Rolling Stone’s recent listing of their 500 Greatest Albums of All Time ranked “Blood On The Tracks” in the 16th spot; his third highest under “Highway 61 Revisited” (4th) and “Blonde On Blonde” (9th). On July 29, 1966, barely two months after the release of “Blonde On Blonde”, Dylan injured himself in a motorcycle accident. Although the scale of his injuries are still unknown, Dylan became reclusive and stayed with his wife Sara to help raise their family in Woodstock. Before the year’s end, he hooked up with the musicians who had backed him on his last tour of the UK, and would eventually become The Band. They recorded demos in a rented house nicknamed Big Pink (yes, THAT Big Pink) which were freely shared by Dylan’s publisher in the hope of attracting cover versions. These songs were famously bootlegged until portions of the sessions were finally released as “The Basement Tapes” in 1975. Dylan’s songwriting was now showing a more direct approach and a heavier influence of country, blues and traditional folk was shining through. This was evident on his last two albums of the sixties, 1967’s “John Wesley Harding” and 1969’s “Nashville Skyline”. The seventies were a turbulent period for Dylan and his first record for the decade, 1970’s double-album “Self Portrait”, was panned by critics and the public alike. Conversely, he released his follow-up album, “New Morning”, that same year which was hailed as a comeback. In 1972, Dylan landed a role in Sam Peckinpah’s movie “Pat Garret and Billy the Kid”, and also wrote the soundtrack, which featured ‘Knockin’ On Heaven’s Door’. 1973’s “Dylan” was a collection of “Self Portrait” outtakes which tanked, but his next record, 1974’s “Planet Waves”, would become his first number one album. He recruited The Band for the accompanying tour, which was documented on the excellent live album “Before The Flood”. This brings us to “Blood On The Tracks”, which was initially recorded at a New York studio in less than a week during September, 1974. Dylan was notorious for working quickly in the studio, but his drive during these sessions were unprecedented. Not wholly satisfied with the results, Dylan returned to his native Minnesota in December and re-cut five of the album’s songs with session musicians. This accounts for the two distinct arrangement styles used on the record. Anything predominantly acoustic can be rightly assumed as originating from the New York sessions, which are by far my favourites. The heartbreaking tale of love gone wrong in ‘Simple Twist of Fate’ ranks as one of Dylan’s finest work, no doubt mirroring his failing marriage at the time. I think the album’s best tracks are the last two, ‘Shelter from the Storm’ and ‘Buckets of Rain’, which feel like that cool glass of water you crave on a hot day. I found it hard to go back to the beginning of the album, as I just wanted to keep listening to those songs. ‘Tangled Up In Blue’ is easily the highlight of the Minnesota recordings, and is possibly the album’s most famous track. Although it is hailed as one of his best, I can’t get into ‘Idiot Wind’. Something about the song annoys me and I can’t get past it. I’m bored after about three minutes of ‘Lily, Rosemary and the Jack of Hearts’ too and I struggle to make it to the nine minute finish line. While this album won’t win you over if you’re not already a Dylan fan, there’s a lot to enjoy here. One of the biggest legacies this record gave the music industry is that you CAN write about your relationship struggles and share your stories of heartbreak, anger and forgiveness. Music doesn’t always have to be about adolescent love or sunshine and lollipops. We see a different Dylan on “Blood on the Tracks”. He’s a man who had fame and critical lauding, despite not really wanting it. A motorcycle accident in 1966 was the perfect excuse to retreat from the limelight for a while. Between his opus that was “Bringing It All Back Home / Highway 61 Revisited / Blonde on Blonde” and “Blood on the Tracks” there were albums that had a few good singles, but none of them stood up as a whole to the standard we’d come to expect from our favourite troubadour. On “Blood on the Tracks” Dylan seems to strip it all back. His marriage was failing and like any poet he channelled that onto the page and held nothing back. What results is an album that is confessional, messy, honest, painful, angry and at times achingly beautiful. These songs range the gamut of Dylan’s emotions, from the tenderness that is ‘Shelter from the Storm’ to the accusational ‘Idiot Wind’, as he left no stone unturned. Dylan has said of the album “A lot of people tell me they enjoy that album. It’s hard for me to relate to that. I mean, it, you know, people enjoying that type of pain, you know?” We need people like Bob Dylan to write albums like “Blood on the Tracks”. They need to be written for those of us who don’t have the lyrical poetry to channel those emotions ourselves. We need them to help us find the voice for whatever our experiences in life may be, because if there is anything that unites us as humans it’s the fact that we all love, we all hurt and we all bleed. Dylan embraced all of that in a beautiful, shambolic mess on “Blood on the Tracks”. Every song that has a place on this album is exactly as it should be. We all know I’m the biggest Bob Dylan fan the world has ever seen, and to be honest I didn’t really enjoy this album. I did however, find a practical use for it. It’s quite relaxing background music. I was playing it driving to my football game yesterday and it really chilled me out, took my brain off the game when I needed it. So well done, Dylan. You came through when I needed you. There were only two songs on “Blood On The Tracks” that I liked, and liked is being generous. ‘Tangled Up In Blue’ was the best choice to open the album. It’s the quintessential Bob Dylan song, following Dylan’s timing and rhyming (Ha!) structure. Musically though, I find it fairly unremarkable, but I guess Bob Dylan’s strength is his story telling, and maybe he wouldn’t want the music taking away from that? It’s a risky mover though, relying on the lyrics for nigh on six minutes. It lost me at about five minutes with no musical dynamics. Indeed the only change comes in the last minute, with the obligatory Dylan harmonica solo. The other song I thought was ok was ‘Simple Twist Of Fate’, and this is mostly due to the bass lines. In this song I tended to lose the guitar behind the lyrics, and the bass stood right out. Again, the song is fairly repetitive, but it is one of the few I could actually listen to all the way through. I can’t help but feel like Bob Dylan was a poet who realised he was never gonna make any money from poems, so he added a guitar and harmonica and bang, rich and famous. I do dig his stories, if only the music was a little more interesting, I would probably be sold. Having developed a liking for Bob Dylan during the afyccim 60’s, I was delighted to find that this was favourite album of the 70’s so far. Compared to 1965’s “Highway 61 Revisited”, this album, “Blood on the Tracks” has a much deeper feel to it. Dylan’s distinct staccato vocal is there, but it has a new warmth and an edge of softness to it, as he tells stories of love and loss. I think that the album overall has more feeling invested in it, with Dylan pouring his own life experiences and emotions not only into the poetic lyrics, but into the music itself. 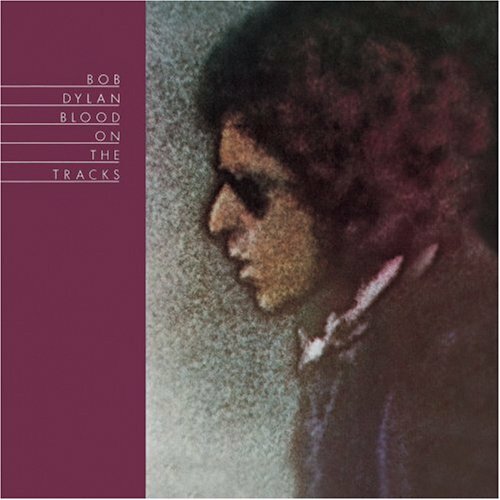 “Blood on the Tracks” is quite intriguing to me, in that the themes are quite dark and melancholic, with Dylan singing about death, heartbreak, political issues and other depressing subjects, but still I am drawn to listen to it, because it strikes a chord within me, and still manages to maintain that air of warmth. Sometimes Dylan is out of tune, and sometimes his harmonica-ing is all over the place, but it doesn’t matter, it’s the imperfections that make Bob Dylan’s work more brilliant and believable, especially listening to it with the retrospect of modern day music (over) production. My favourite track of the album is ‘If You See Her, Say Hello’, Dylan sings so earnestly with a certain vulnerability that gives me goosebumps. It’s the first Bob Dylan song I’ve heard where I felt he was truly wearing his heart on his sleeve, in a really personal way. Some people have touted this album as Dylan’s greatest; I can’t confirm nor deny this claim, since I have only listened to 2 of his 35 studio albums. But I can say that this is the side of Bob Dylan I like; vulnerable, open, honest and even more believable. This album is the first of many transitions in the long career of Bob Dylan. His songs and albums have been woven into pop culture over the decades, and love him or loathe him you don’t have to look far to see his influence on popular music. Up until this point, Dylan had been making albums that were very sparsely produced; often just his voice, a guitar and a harmonica. He had been hailed as the saviour of the folk scene and found himself the unwilling spokesperson for a generation. He had brought out “Bringing It All Back Home” five months earlier, which featured a full electric rock band arrangement on all the songs on the first side. Although the second half of the album appeared to be his trademark acoustic folk/pop fare, he had moved away from the protest songs he had become synonymous with, favouring introspective and emotional themes. Shortly after that album’s release, Dylan performed a set at the Newport Folk Festival that saw several audience members boo him for playing an electric guitar, and having a full band. Many members of the folk scene mourned that he’d lost his way and betrayed them. Dylan just wanted to sing his songs, and not go out on stage by himself for the rest of his career. ‘Like a Rolling Stone’ is probably the most famous song on “Highway 61 Revisited”, regularly sitting at high positions on Greatest Song polls around the world. When Bruce Springsteen inducted Bob Dylan into the Rock & Roll Hall of Fame in 1988 he said that the song’s opening snare shot “sounded like somebody’d kicked open the door to your mind”. What a fitting way to start this album, and to finally signal the end of his time as a protest singer. The song also changed the blueprint of the radio hit single by exceeding the hallowed three minutes and coming in at over six. To call the song a classic is an understatement; most people upon hearing the first line will chime in with “didn’t you?”. There are so many great moments here. The seedy sounding piano that opens ‘Ballad of a Thin Man’ makes the listener feel like they’ve stepped into the wrong saloon, especially when the ominous chorus line comes: “Because something is happening here/But you don’t know what it is/Do you, Mister Jones?” In the ramshackle rush of ‘Tombstone Blues’ Dylan threatens to leave the other musicians behind as several cues are nearly missed throughout the track. The wonderful ‘Queen Jane Approximately’ just might be my favourite Dylan song title and the rock chug of ‘From a Buick 6’ will get any foot tapping. The last song on the album is the only one without drums or an electric guitar, the beautiful eleven minute epic ‘Desolation Row’. What the song means is anyone’s guess, but the imagery is astounding. Dylan peppers the lyrics with many characters – fictional, biblical and historical – that drop in and out like tourists. The constant flourishes from Nashville’s Charlie McCoy on flamenco guitar adds to the beauty of this exceptional song. Arguably one of the best closing tracks ever recorded. What Dylan did with this record was challenge his fans. Some turned their back, some came through the door kicking and screaming; others more willingly. I believe he showed other artists they could reinvent themselves, and acts like the Beatles, Bowie, U2 and Madonna took note. I saw Dylan at the Blues n Roots Festival in Fremantle last year and he performed three songs off this album. For an artist who doesn’t often look back, that’s a testament to his opinion of the record, and its enduring legacy. Bob Dylan was, and still is, quite a prolific writer. In the 60s he released nine albums alone, of which a handful could have been included in this project. 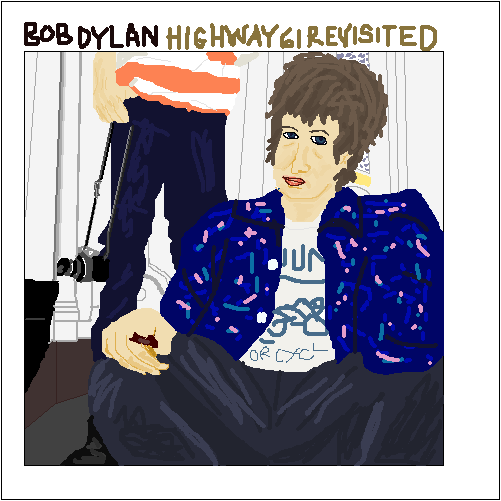 “Highway 61 Revisited” was recorded around the time the Dylan ‘went electric’, thus upsetting the folk kids. Those with an open mind saw it for the brilliance that it was. It is with good reason that two of Dylan’s albums feature in the top ten of Rolling Stone magazine’s ‘500 Greatest Albums of all Time’, with “Highway 61 Revisited” coming in at #4. For those playing at home the song ‘Like a Rolling Stone’ came in at #1 on their ‘500 Greatest Songs of all Time‘ list. Now, I want to talk a little bit about poetry. The term ‘high school poetry’ is one I’ve bandied around a bit. 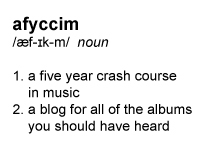 I use it to describe lyrics that whilst have good intentions come across a little forced and, dare I say it, pretentious. They are lyrics that try hard to be meaningful or clever but tend to be intellectualised rather than emotionally realised. Real poetry, to me, doesn’t need to be understood. It transcends the words and it’s something you connect to or don’t. It’s like good art or music. You don’t know why you like it, you just do. Do I understand the lyric “The sun’s not yellow it’s chicken”? No. Do I care? Not at all, because whilst I don’t understand it, I believe Dylan does. And this is where Bob Dylan, like so many of the great writers and poets, excels for me. This an album I’m very familiar with, so it was an absolute pleasure to revisit it all week long. I’m hard pressed to pick a favourite song as the album is so solid, but at a push I’d say ‘Queen Jane Approximately’. Fun fact: one of my favourite things in the world to do is sing crappy pop songs in the style of Bob Dylan. Try it! This is not the first time I’ve listened to this album. I’ve enjoyed it before. It kicks off with ‘Like a Rolling Stone’, which is a timeless classic. The song that was written after Dylan completed a long slog of a tour of England. It was never meant to even be a song, it was just Dylan channelling his anger on paper, until he read it at the piano. It changes the song a bit for me, thinking of it in its context. After that though, the whole album is a bit of a blur to me. Perhaps I’m the only one, but every song seems very similar. I did take particular notice of ‘Tombstone Blues’ though. It’s a pretty fun song, even if I had no idea what it was about. That brings up my next point: does anyone have a clue what Bob Dylan was on about? At all? Ever? Maybe it’s just too deep for me. ‘From a Buick 6’ is the track I think is the best musically, with a rock solid bass line, that typically jangly guitar sound, and a blazing harmonica solo. And why not, when you play blues harmonica like that! ‘Ballad of a Thin Man’. What an odd song. Wikipedia says that it’s the story of a normal bloke walking in to a room of “intentionally bizarre circus freaks”. Whatever it’s really about, there’s an awful lot of “and he said, and you said”. Also, points for using the words “one-eyed midget” in a song. 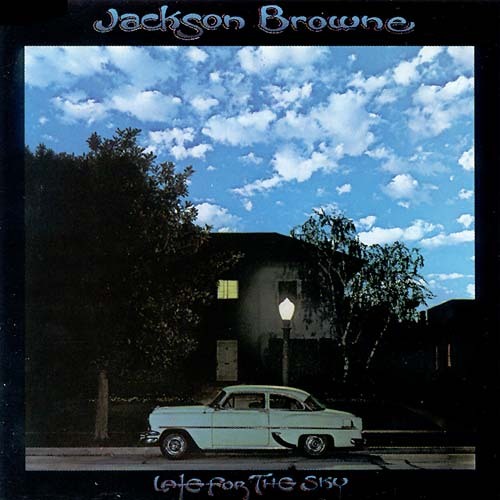 If you’re a folk/blues fan, you probably dug this album. This time around, though, I just couldn’t get in to it. Ok so if you’re like me and think that Bob Dylan is not for you, you’ll soon see the error in your ways, because, truth be told, Bob Dylan has something for everyone. Dylan’s style traverses many musical genres, including folk, rock and roll, blues, gospel, country and rockabilly. This album was quite revolutionary; it pioneered the blending of folk and rock, by utilizing a mixture of acoustic and electric instrumentation. I think that this gives the songs a really rich depth of sound and it makes it easier to distinguish the different timbres of the instruments, which I really like. I was transfixed by Dylan’s distinctive staccato vocal and vividly descriptive lyrics. He really is a bloody fantastic story teller and you find yourself waiting for the next verse, just to find out what happens next in the tale he’s recounting to you. I also found myself trying to figure out the hidden meanings behind what he was saying, particularly in tracks ‘Like a Rolling Stone’ and ‘Tombstone Blues’, which feature highly loaded lyrics. At times I felt as though the whole thing was about to fall over; on several of the tracks the lead guitar seems to drop out of sync with the percussion. And on others, the lead guitar is really out of tune (‘Queen Jane approximately’). Somehow it still works a treat! My stand out favourite track is ‘Desolution Row’, which is thought to tell the tale of the lynching of 3 rapists in Dylan’s home town. This song cleverly juxtaposes the unspeakable; a pretty ballad accented with a south-western style counter-melody, and is the only fully-acoustic song on the album. In fact this track epitomises everything that Highway 61 represents; beautiful and understated musicianship, poetry, and social commentary. A perfect conclusion to a truly iconic album that I can honestly say I wholeheartedly loved.